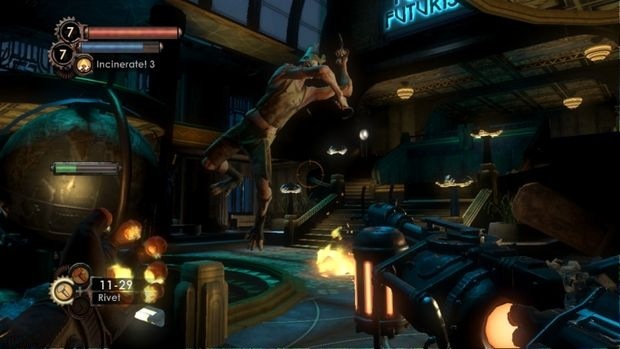 2K Games invited some select journalists to a fancy hotel room in San Francisco to show off some footage for it’s upcoming oddity Bioshock 2. Unfortunately my invitation must have got lost in the mail but thankfully Eurogamer and Destructoid have posted up their thoughts on it already and I have to admit that I am surprised by the outcome. While we obviously know that 2K put their best foot forward during the showing the results have been universally fantastic and even more surprising is that all the praise has been lavished on the story of the sequel. I didn’t think the idea of a Big Sister was any good but it sounds like 2K have really gotten a handle on the idea and since they made Bioshock just that brilliant I guess we need to give them the benefit of the doubt for now. Next article Are Sony going to pull a Crackdown stunt with InFamous?